N.B. In all honesty there are numerous other avenues we could explore with this paper. For instance, there are numerous ways to measure the capacity of a language’s phonological resource (Ke, 2006), with there being plenty of alternative positions to phonemes: distinctive features (Chomsky & Halle, 1968), syllables (Levelt & Wheeldon, 1994), exemplars (Johnson, 2007) and rich, high-dimensional memory products (Port, 2007). Furthermore, there is a case to be made for phonemes being an emergent aspect of a speech community, rather than having explicit psychological forms (Port, 2010). Another point concerns the reliability of the data collection: for each language, or dialect, the study is reliant on the choices of potentially one researcher, at a very specific point in time, and with only a finite amount of resources. The loss of phonemic diversity following a population bottleneck is predicted under a range of cultural transmission models… This effect is expected to operate on top of any immediate reduction of phonemic diversity due to sampling only part of the dialect variation from the parent population. Is the serial founder effect a plausible model? 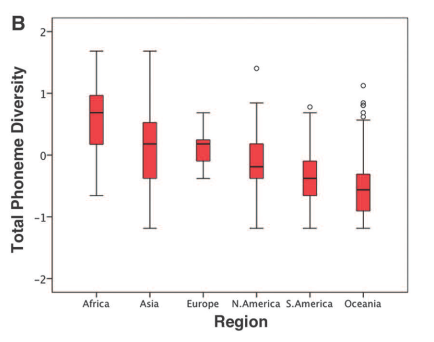 The “southern African origins” conclusion of the paper comes out of a simple analysis that assumes that the best-fit maximum for genetic diversity (as assessed by linkage) is the most likely point of origin of the population. That would be true if the African population emerged by a series of founder effects from a single small ancestral population — the “serial founder effect” model that I have criticized here before. But of course in 2011, we know that model is false, because it is predicated on a lack of ancient mixture with Neandertals or other populations. If the serial founder model can’t work outside Africa, it certainly can’t work inside Africa, where populations were larger and regionally diversified during by the beginning of the Late Pleistocene. Without that false assumption, the “southern African origin” evaporates. The primary observation, a cline of linkage disequilibrium within sub-Saharan Africa, can be explained with reference to mixture of populations without assuming an origin and expansion from one geographic location [my emphasis]. Similar problems exist for phoneme inventories. I’m not saying that Atkinson thinks that serial founder effects are solely responsible for the observed patterning (as noted in the quote above)… But I do think the model’s flawed on several theoretical grounds. Specifically, Atkinson hasn’t ruled out the possibility of selection as having shaped these languages according to different socio-cultural niches. Much of the research I’m doing builds upon a paper by Lupyan & Dale (2010) where they put forward the Linguistic Niche Hypothesis: “that language structures are subjected to different evolutionary pressures in different social environments. Just as biological organisms are shaped by ecological niches, language structures appear to adapt to the environment (niche) in which they are being learned and used”. Building upon previous theoretical work (e.g. 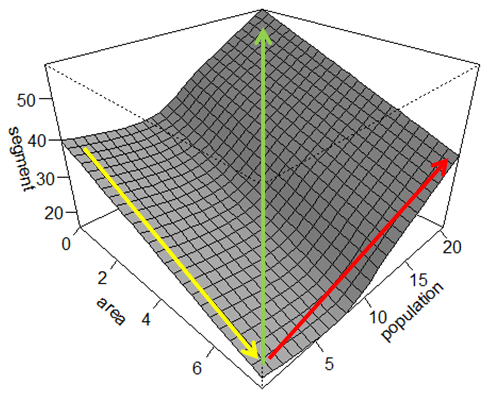 Wray & Grace, 2007), the authors propose that exoteric niches (large number of speakers, large area, many linguistic neighbours) and esoteric niches (small number of speakers, small area, few linguistics neighbours) will produce languages adapted to these respective socio-demographic conditions. One of these pressures is learnability: that languages adapt to become increasingly learnable for their speaker-hearer community. So, for example, a language that’s increasingly being learned by adults will be under a pressure to become tailored for adult-learners. Lupyan & Dale’s claim is that demography can amplify these learnability pressures: “With the increased geographic spread and an increased speaker population, a language is more likely to be subjected to learnability biases and limitations of adult learners”. To test their claim the structural properties (e.g. case systems and the complexity of conjugations) of more than 2000 languages were compared with a language’s speaker population, its geographic spread, and the number of linguistic neighbours. They found that exoteric niches tend to produce languages with simpler inflectional morphology, and an increased reliance on lexical strategies to encode certain linguistic features (e.g. evidentiality), than those in esoteric niches, where languages are more morphologically rich. The salient point: certain differences in structural complexity partially pattern with the underlying demographic conditions of a speaker community. Lupyan & Dale’s findings beg the question of whether large-scale changes in the linguistic niche also influence the phoneme inventory through the distribution of phonetic variation and a shifting of the selection pressures. In this context, we should also remember the obvious fact that phonemes are part of a wider linguistic environment: they are not easily divorced from the constructions being used and learned by individuals within a speech community. If phoneme inventories, as Atkinson argues, are largely a product of demographic dynamics, then we should not expect to see any adaptive patterning between phonemic diversity and other linguistic levels of organisation (e.g. morpho-syntactic features). My argument is that there is evidence for language adapting to its socio-cultural niche — and the phoneme inventory size is a big part of the story.